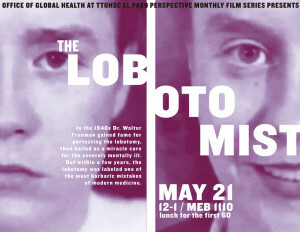 The Texas Tech University Health Sciences Center El Paso Office of Global Health Perspective Monthly Film Series will present “The Lobotomist” on May 21, at noon, in the Medical Education Building, room 1110. “The Lobotomist” is a gripping and tragic story of an ambitious doctor, the desperate families who sought his help, and the medical establishment that embraced him. This documentary offers an unprecedented and serious look at one of the darkest chapters in psychiatric history. It also helps raise important questions regarding the stigma that still surrounds mental health. How much does the general public and general medical community really know about mental health? Are we doing enough? The World Health Organization (WHO) reports that untreated mental disorders account for 15 percent of the total global burden of disease. Mental health disorders are characterized by abnormal thinking, mood or behaviors associated with impaired functioning. Mental illness affects nearly 12 percent of the world’s population – about 450 million or one out of every four people around the world. 800,000 people die in the world by suicide every year- that’s one person every 40 seconds. These deaths are preventable. They are effective strategies and treatments for mental illness. In the United States, around one in five adults in the U.S. experiences mental illness in a given year. Suicide is the third leading cause of death in youth, ages 10-24. Help raise awareness and share these facts about mental health. Employees and their families are encouraged to speak to their primary care physician or pediatrician about any mental health concerns they may have. TTUHSC El Paso has an Employee Assistance Program (EAP) which offers counseling services to employees and immediate family members – and it is completely confidential. The number to EAP is (915) 215-5850. Paul L. Foster School of Medicine, Gayle Greve Hunt School of Nursing and Graduate School of Biomedical Sciences students also have mental health care services available to them. Please speak to your Student Affairs Office for more information on accessing those services.